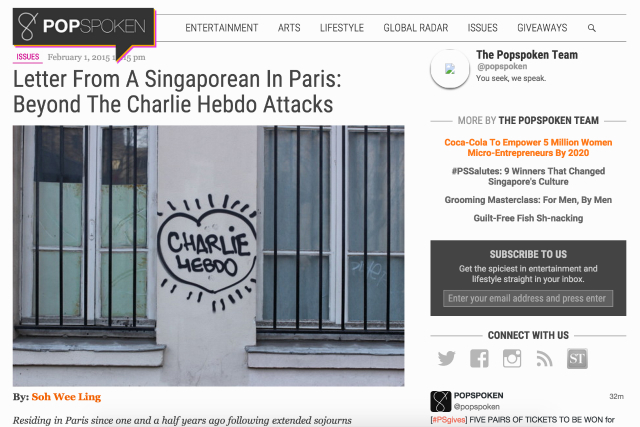 First published by Popspoken, February 1, 2015. Even as the minutes ticked dangerously close towards 2pm on January 11, we weren’t sure if we would make it to the rally at Place de la République. I hesitated, seeing as my husband had been sniffing and sneezing for the most part of the weekend. His mother had also called to ask us not to go, worried that it might be dangerous. In the end, we were glad we did — together with my mother-in-law, who was visibly emotional as we marched at a snail’s pace in the crowds, tears in her eyes. This was her first protest in 20 years. The street where the Kouachi brothers had ditched their getaway car is just a 10-minute walk from my apartment. The Charlie Hebdo office isn’t too far either, located in one of my favorite parts of Paris where you can find me more often than you can spot me strolling by the Seine. I’ve never been in this close proximity to violence, having been cocooned in the relative safety of Singapore and other cities in Asia I had lived in. Following the attacks, comes the rampant discussion, particularly from American and British commentators, on how the right to defend free expression does not necessarily involve the dissemination of racist cartoons. The Charlie Hebdo cartoonists might be (extremely) provocative but the one thing the French will tell you is that you cannot accuse them of being racist. The editorial cartoonists at Charlie Hebdo embrace anarchism whole-heartedly — mocking the anti-immigration ideologies of the far-right National Front party one day and the Pope another. No god and no authority is too sacred for their crosshairs. Their irreverent caricatures are Islamophobic only if taken at face value and out of context. The caustic irony of their cartoons has all along been intended for a French audience familiar with “second degree humour” that is now lost under international scrutiny. Last week, a mainland Chinese friend in France told me that he doesn’t see the purpose behind the rally and feels that more should be done to break up terrorist groups instead. But religious radicalism shouldn’t be the only focus here. What’s equally important — but probably tougher — to look into are France’s fundamental issues in integration, banlieues and equal opportunities. It’s not just about encountering problems finding a job if you are a second or third generation French citizen of North African descent or if your name is Mohamed. My husband fits the profile of a native Frenchman but did not receive a single response out of over a hundred applications he sent out when he first graduated from law school because he was then living in a northeastern banlieue with a bad reputation. I don’t think much has changed since the French cult classic La Haine was released in 1995 — neither economic discrimination nor racial segregation. Sadly, what little has changed is the polarization of ethnic relations — it’s probably safe to say it is not as common to come across fast friends consisting of Jewish and Arab youth in the projects like Vinz and Saïd from the movie. Until the day the Republican motto of “liberty, equality, fraternity” is genuinely attainable for all French citizens, no one can say for sure the world wouldn’t see another Coulibaly or Kouachi. And we can’t just blame radical Islam for it. I’m still getting to know Paris, a city which I will be sure of returning to year after year should we move back to Singapore one day. It’s now home, like Singapore, but one that I’m just starting to understand more about. Familiarly pluralistic but also differently so, involving the ghosts of a colonial past that are often swept under the carpet. The January 11 unity rally was purportedly the largest demonstration in modern French history and showed us what the silent majority is capable of. This I learnt, and I was equally touched by the number of parents who had brought their children, strollers and all, in spite of the security concerns. The crowds were orderly and shuffled along, their quiet buzz peppered only with the claps and cheers of a recovering, defiant nation. This is a very good article. One of the few very inspiring responses to these horrible attacks in Paris. I translated a text by Liao Yiwu, a Chinese writer in exile in Germany. His text appeared in the Neue Zürcher Zeitung. It is also available in English, on the website of the German Book Trade Organization. Your response should equally be read by as many people as possible! I hope it is appearing in a newspaper in Singapore or Hong Kong, for example? Taipei Times would also carry it, I am pretty sure. Or Japanese media in English. Anyway, great text! Thank you very much! I went demonstrating in Vienna on January 11, and again on Friday, January 30, when the xenophobe Neo-Nazis had their ball in the historic halls of the Hofburg in Vienna, overlooking the Heldenplatz where Hitler spoke to eradicate Austria in 1938, cheered by thousands. We were around 5000-6000 at least all over the center of Vienna, although the police had cordoned off a large area and many people had been arrested and criminalized last year. No windows broken this time, and hardly anyone injured. Some people always get angry, and there are Neo-Nazi sympathizers in the police and in parliament. And they have been tolerated and cosseted, and they were in government 2000-2006. Recently an editor of the newspaper Der Standard, which has been very much against the fascists, has actually suggested that the Social Democrats should consider working with the F-Party. In Germany, their slogans would not be allowed, and some of their leaders would be in prison. On the other hand, we have a cherished tradition of fierce satire in Austria. I read an article by the Jewish French-German writer Gina Lustiger, published in Die Welt. She also said, just like you, that the Charlie Hebdo cartoons were aimed at the average French citizens, including the cartoonists themselves. She said she missed them very much, missed their incisive humor. And she emphasized that unless the French Jewish victims were equally respected, even if their relatives had them buried abroad, people had not understood what this was about. Unless you can imagine Charlie as a Turkish woman in a head scarf at a funeral in Jerusalem, she said. Thank you very much again!